Washington is terribly divided these days, but there is at least one thing everyone — the Trump administration, members of Congress from both parties, journalists, cabdrivers — clearly agrees on: If the public ever got to see President Trump’s tax returns, it would be utterly disastrous for him. Though they haven’t done it yet, Democrats are planning to utilize a law allowing the House Ways and Means Committee to obtain any American’s tax returns to demand that the IRS turn them over. Once they have them, the committee can vote to release them to the entire House. Legal experts make clear that the law is not ambiguous and the president can’t simply order the Treasury Department to keep his returns secret. So the administration’s plan seems to be to wage a PR battle while keeping the matter slogging through the courts for as long as possible — say, past November 2020. once Democrats demand the returns it will become an intense controversy playing out on television and the front pages of newspapers. That means that Republican officeholders will be forced to take a position, which they haven’t really had to do before. And they’ll be expected to defend the president’s refusal to allow the public to know where he’s getting money from, whom he owes money to, and how far his financial interests extend. Trump himself began in 2016 by saying he couldn’t release the returns since he was being audited. This was a lie. The IRS doesn’t prevent you from releasing your returns if you’re being audited, and it’s not as though you have to keep something secret from the IRS, since it already has the returns. Then once he took office, the White House stopped bothering to offer a rationale at all, responding to any question about the returns by saying that Trump won, so forget it. So imagine you're a Republican member of Congress. When this controversy becomes intense, you're going to have to answer two questions. The first is, should Trump release his returns? If they're going to be steadfastly loyal to Trump — which is the most important principle the GOP holds today — the answer they'll have to give is no. The second question is, why not? There is a dodge that Republicans can employ to those questions, and it's one I expect most of them will use: "That's up to the president. I'm more concerned with the vital issues facing the American people." In other words, please don't make me defend Trump. They know who the president is. If they actually believed that Trump's returns would show him to be a man of unimpeachable integrity who had committed no wrongdoing, they'd be perfectly happy to have the public see them. But we all know that's not what the returns will show. So they shouldn’t be allowed to get away with saying it isn’t really their concern. When we have a president as corrupt as this one, it’s all of our concern. And we need to find out exactly what he has been up to. Trump and the GOP would vastly prefer a permanent deep burial as distant as possible from any sunlight. As long as they tuck Trump in there with them, I'm on board. I think we've found a bipartisan solution! Just remember, if they can do it to Trump they can do it to you too....and Republicans can do it to Democrats (assuming they ever manage to get elected again). Tax returns could be made a public record just to make sure that nobody is getting over on anyone else. I mean, it would be important to know if your neighbor really deducted their veterinary bills last year while you were honest and didn't, right? Every democratic president has made their tax records public knowledge. And so has every republican president. Not to mention every democratic and republican (and probably independent) nominee who has ran for President over the last 40 years or so. Luther’s concerns are a bit.... odd. There is no Constitutional requirement for anyone to release their tax returns. As such, it's a matter of personal privacy and should be respected...unless you don't believe anyone should have personal privacy. Everyone should have personal privacy except someone campaigning to be the President of the United States. I want to see his or her tax returns before I vote for them. The IRS can audit me anytime. 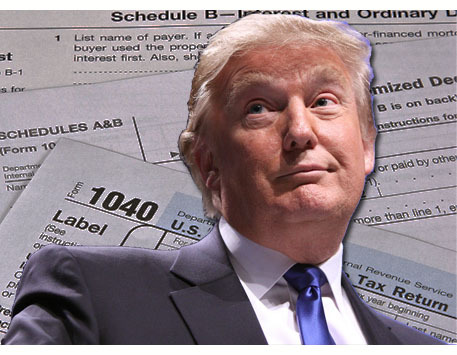 Trump is the first presidential candidate in 48 years to refuse to release his tax returns. That's presidential candidate, not simply president. We're talking hundreds of individuals? Last edited by Rogue Valley; 02-06-19 at 03:57 PM. Must be nice to just violate a person's RIGHT TO PRIVACY whenever one wants. Talk about abuse of power.